Ostraka (potsherds). 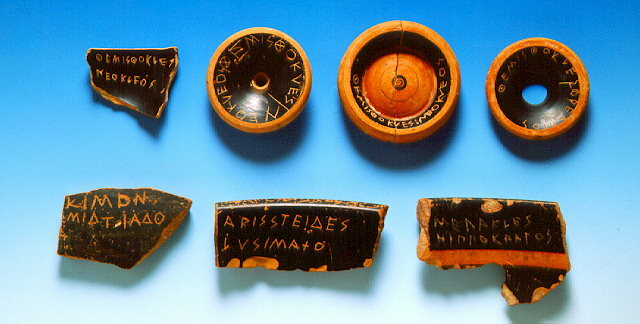 These inscribed potsherds, called "ostraka" in Greek, were used as ballots in the process of ostracism. When there was fear of a tyranny, the Athenians voted to exile those politicians who were considered dangerous for Democracy. The names of prominent politicians exiled in this way, such as Themistocles, Aristeides etc. are inscribed on the sherds, dated to the 5th century B.C.